We at Geeky Hobbies would like to thank Eugen Systems and Focus Home Interactive for the review copy of Act of Aggression used for this review. Other than receiving a free copy of the game to review, we at Geeky Hobbies received no other compensation for this review. Receiving the review copy for free had no impact on the content of this review or the final score. Ever since I can remember I have always loved the RTS genre. StarCraft is one of my favorite video game franchises of all time. Unfortunately the RTS is not a mainstream genre these days. You can usually find at max a handful of decent RTS games released every year. Other than studios like Blizzard, video game developers are rarely willing to take risks on the genre anymore. This brings us to Act of Aggression is a recently released RTS created by Eugen Systems and Focus Home Interactive. While there is a lot to like about Act of Aggression, due to the heavy focus on combat, Act of Aggression wasn’t the game I was hoping for. Most RTS games have two main mechanics. There is base building and troop deployment/combat. When I play RTS games, I usually prefer the base building/resource gathering aspects of the genre. While a lot of people hate having to build up their bases and gather resources, for some reason I have always enjoyed this part of RTS games. I would actually prefer to build up the military forces and let someone else deal with the battles themselves. While Act of Aggression still has quite a bit of base building/resource gathering, these aspects seem to be somewhat streamlined. Act of Aggression doesn’t have your typical worker unit that gathers resources/builds building. When you place your building the game automatically send out a unit that builds the building and then it disappears.Unlike a lot of RTS games you must build all of your buildings within a certain distance of the main building. You can build buildings that extend this range but this forces you to plan out how you want to build your base. You have to build your buildings somewhat close but you don’t want to build them too close because if one building explodes it will damage nearby buildings. The problem I had with the base building is that there are too many buildings and a lot of them look a lot alike. What I like about StarCraft is that all of the buildings are distinctive which makes it easy to determine what each building does after you get used to the game. After playing Act of Aggression for a couple hours I still couldn’t tell many of the buildings apart. This forced me into clicking on all of the buildings until I came across the building that I was looking for. I think the game would have benefited if some of the buildings were combined. For example in StarCraft there is usually one or sometimes two buildings dedicated to ground vehicles. 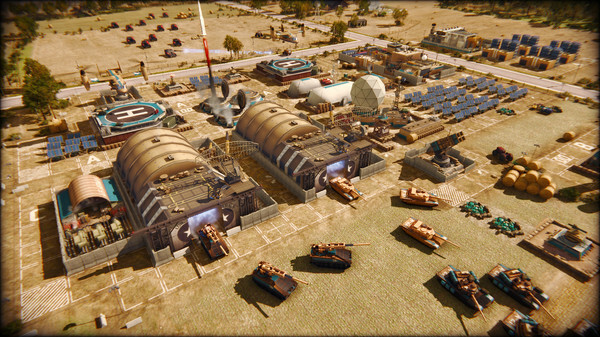 In Act of Aggression there are three or four buildings that have ground vehicles. This forces you to click through all of your buildings hoping to find the one that you need. In Act of Aggression you can gather resources in a couple different ways. You can build refineries where you can extract resources like a traditional RTS. You can also get additional resources by capturing enemy combatants or controlling various buildings that give you resources when they are occupied. I liked the different options of acquiring resources in Act of Aggression. While I had some issues with the base building mechanics in the game, I still thought they were pretty good. I have never been good at the tactical side of battles in RTS games. Generally my strategy in these types of games is to just build up a large group of troops and just overwhelm the enemy. Since I find it too hard to micromanage my troops, I would rather just throw them all into the fire instead of strategically deploying them. In games like StarCraft this works in the campaigns and against other average players online. Since I care more about the base building I like that you can still succeed in those type of games without a good eye for strategic combat. This will not work in Act of Aggression which makes the game a lot more difficult than I was expecting. Unlike StarCraft where you don’t have to be that strategic with your troop deployments, you can’t do this in Act of Aggression. If you don’t have the right set of troops you can’t just power your way through with pure force. If you don’t have the right troops, your army can be wiped out within a minute forcing you to rebuild your whole army which might not be possible since you used up all of your resources. This means you will either lose to your opponent or you will have to restart the campaign level. I know that I am usually terrible at tactical combat in these types of games but I think that the game could have done a better job training you to be better at the tactical aspects of the game. While I give the game credit for slowly introducing new mechanics into the game, the game doesn’t really do a good job explaining the strengths and weaknesses of each unit and how you should deploy them in any given scenario. Not being a tactical genius, I would have found this to be very helpful. While I didn’t particularly like the tactical combat, people who enjoy this type of combat should really enjoy Act of Aggression. The game provides players with many options of how to manage their troops. I really liked the idea of letting troops garrison inside buildings in order to gain cover and a strategical advantage over other troops. The game appears to have quite a bit of depth for players who like to micromanage their troops. Overall it is kind of hard to estimate how much time you can get out of Act of Aggression. If you looked at my Steam profile my playtime is not that long. So far I have only played about half of one of the campaigns. I would guess that the campaign will probably last around 10 hours but it could be shorter since I haven’t finished all of it and I wasn’t particularly good at the game. I have yet to try multiplayer because I would be destroyed. Act of Aggression is the type of game that I will probably play occasionally in order to complete the campaign mode. Just like most RTS games though, the multiplayer will be the true test for the game. You will almost always spend more time in the multiplayer than you do in the single player for a RTS. I can’t really comment on the community for Act of Aggression since I haven’t played any online games. I think the game’s mechanics could work really well for a multiplayer game though. With a retail price of $45, Act of Aggression will not be for everyone. If you don’t like RTS games or don’t like games that rely heavily on tactical strategy, Act of Aggression is probably not worth it for you. It might be worth a purchase during a sale but I don’t think you will get your money’s worth at the $45 retail price. If you like combat centered RTS games and like to play multiplayer matches, I think you should like Act of Aggression and should get your money’s worth. I had a hard time telling a lot of the different types of troops apart. Unless you zoom in closely it is hard to tell the difference between troops. The individual soldiers are sometimes hard to see at all. There are at least five different tank types which were really hard to tell apart. Since your troop deployments are so important for success, it is hard to properly control them when you can’t even tell them apart. I found it really hard to use individual soldier units. The problem is that they walk way too slow and it is too much of a hassle loading them into transports and then unloading them when you get into a battle. At first I was getting frustrated that all your troops would move at different speeds which made all of your troops arrive at different times or you had to micromanage their movement every few seconds. After playing the game for a while I found the setting in the options menu that forces all of your troops to move at the same speed. Due to these problems I tried to use as few individual soldiers as I could. Overall I found the story to be kind of bland. I haven’t finished it yet but it just seems like another story where you are trying to stop terrorists/the bad guys. There just isn’t anything particularly interesting about the story. This is accentuated by the voice work in the game. Some of the voice acting is not bad but some of it is bad. I found the graphics to be pretty good. Obviously if you zoom in right next to your troops they aren’t going to look fantastic since they never do in RTS games. The game does a good job maximizing the graphics based on your hardware specs even though it takes a couple of minutes to do it. I really liked the satellite view which makes it easy to see all of the buildings, troops and resources in your bases. The game did appear to be kind of slow switching between the different camera angles though. Act of Aggression is a good game. The game is interesting and has some good mechanics. The game gives you a lot of options as far as combat is concerned and does a good job streamlining the base building aspect of the game. Unfortunately if you are not good at tactical combat you could really struggle with the game. Act of Aggression is the type of game where if you don’t have the right deployment of troops, your army can be wiped out quickly. The combat relies heavily of having the right troops for the right situations. I generally prefer RTS games that focus more on the base/troop building and less on the tactical deployment of your troops. I had fun with Act of Aggression but it is not the type of game that I would play all the time. If you like micromanaging your troops though I think you will love Act of Aggression. Players who like this type of combat could probably add at least another point to the score that I gave Act of Aggression since you should like it a lot more than I do. A well developed RTS with some unique mechanics. A great game for people who enjoy tactical battles. A lot of the base building operations have been streamlined for people who don't enjoy this aspect of traditional RTS games. The game focuses too much on exploiting tactical advantages. If you don't have the right troops you could lose your whole army in less than a minute. The story is kind of bland.